Sign up and receive Property Email Alerts of Houses to let in Forest Estate Villas, Zimbali Coastal Resort. Limited special offer over the Easter period, pay a reduced amount of R9000.00 per-night. This elegant home is nestled underneath the cool forestwood canopy with sweeping views towards the Indian Ocean beyond, it gives the feeling of serenity and restfulness. This villa commands 'pure elegance & chic sophistication, making it the most stylish of hideaways for an idyllic break away. There is a sparkling pool and relaxing, breezy outdoor entertainment area, the perfect place to put your feet up and relax. Four beautifully appointed bedrooms en-suite, with two TV lounges, a spacious modern kitchen and scullery and a dining table fit for a King! No golf cart included in the rental amount (please see booking forms for details). Within 3 minute drive from the Valley of the Pools, The Lodge and the Golf Club. No Smoking Allowed. Toilet paper, dishwashing soap and black bags provided on arrival. This is a self catering home. Please contact us for our extensive property portfolio options. 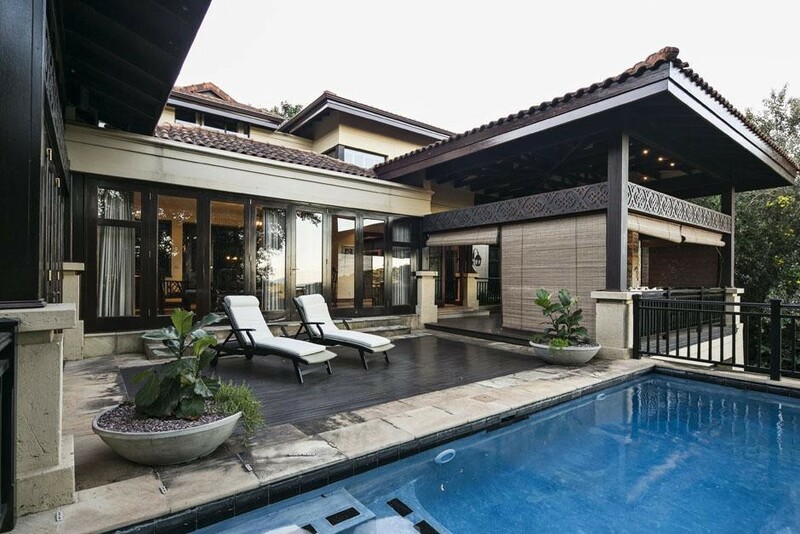 Sign-up and receive Property Email Alerts of Houses to let in Forest Estate Villas, Zimbali Coastal Resort.